Blog and podcast regular Maciej Słomiński remembers the recently murdered Gdańsk Mayor Paweł Adamowicz and all he did for his club Lechia Gdańsk. I will put it straight: if it wasn’t for the murdered Mayor Paweł Adamowicz Euro 2012 wouldn’t be played in Gdańsk at the prettiest venue in Poland (and Europe?) and Lechia wouldn’t be playing top tier football. It’s that simple, I’m not exaggerating. The late mayor’s older brother Piotr, was the one who helped Lech Wałęsa into the stadium for the legendary Lechia – Juventus European Cup Winner’s Cup match in 1983. Later Piotr Adamowicz spoke to the camera men from NBC and CBS, who trained their cameras on Wałęsa in the crowd. Then it all began, a game of football which changed into a rally for the then illegal ‘Solidarność’ movement. Wałęsa received a Noble Peace Prize the next week and the game gave fuel for resistance for another couple of years. There was even a book published about this game – more on it here. having ‘Solidarność’ roots went into massive decline. There were dubious mergers but then in 2001 they went bankrupt and had to start from the A klasa (6th tier). A handful of fans who remained loyal went around the city to seek help. – ‘We won’t talk to thugs’ – was the usual answer. Municipal elections were held a year later. Lechia fans decided to take part and created a voters’ committee called Naprzód Lechio (Forza Lechia). It gathered over 4 thousand votes, twice the number of people attending actual games of football then. Before the second round of the mayorial elections fans finally got to meet Adamowicz in a club that was the seat of the representative of the League of Nations in the Free City of Danzig before WWII. The Mayor saw that football fans are not Neanderthals who can’t put two sentences together and are quite well organized. The White and Greens gave Adamowicz their support while he decided to finance a star for legendary striker Roman Rogocz at the Lechia Hall of Fame. His critics said he’s just putting on a show, that he’s just a ‘Sunday fan’ (a malicious expression in Polish). But they were right about the Sunday part! Our jaws dropped when we saw Adamowicz in a white and green scarf entering the stadium in Reda on a Sunday early afternoon (Reda is a small town just north of Gdynia). The occasion was a 4th tier game between local side Orlęta and Lechia for the opener of the spring round opening in freezing conditions. Lechia won 3:0 with Marcin Kaczmarek scoring two. This guy is married to Magda Skorupka-Kaczmarek who, years later, became the Mayor’s, as it turned out to be, last spokeswoman. It was the middle of his term, there was no need to gain any votes, why was he even there? As many before and after him he just wanted to be there – the Polish equivalent of a windy night in Grimsby, he was already infected by the Green and White religion then. It must be said that it was Maciej Turnowiecki spreading the disease, now Lechia’s chairman, before that the Mayor’s…spokesman. You have to understand that without public entities there would be barely any sport in the former Warsaw pact. So when the City of Gdańsk was selling their water supplies system to a French company called Saur, Adamowicz did everything to make Lechia part of the deal. Saur sponsored the club with annual amount of 70,000 złotys (14,000 pounds) – now it looks funny, one footballer earns that in a month but then it was like discovering a gold train. Anyone who wanted to talk and deal with the City had to cooperate with Lechia. Be it municipal bus or heating companies. In 2008 Lechia finally reached the top tier, 6 promotions in 7 years, is that some kind of a record? In the bad old Communist days there was a saying there are 3 places where you can be free in Gdańsk: the shipyard, the Church of St. Brigid and Lechia’s ground on Traugutta street. So Adamowicz was giving something back. Finally it was time to leave the oasis of freedom and move to a new ground, built for Euro 2012 to be held in Ukraine and Poland. As early as 2005, Adamowicz was the first who declared his city’s readiness to host Euro 2012. Lechia was in division 3 then, how could Gdańsk host such a tournament ahead of, amongst other cities, Kraków? Another Lechia fan (Donald Tusk currently President of the European Council) was in charge of the country then so maybe that’s why Adamowicz was so certain? We were worried how Gdańsk’s Old Town, more used to German pensioners, would cope with football tourists. But after we saw Spanish and Italian fans jumping on Piwna (Beer) street on police cars roofs together with their owners we just knew it was going be ok. When the Irish took over Długi Targ (Long Street – which is not that long between you and me) we just couldn’t believe how beautiful it was. They were also laughing at the English as they do as the Three Lions were sent to Donetsk, with all due respect to that once great city. Now after his tragic death there is talk of naming the stadium after Paweł Adamowicz. And rightly so. It was the apple of his eye. It was a cold war between Lechia and the City – and the football club decided to create a company with a private investor from Wrocław. The Mayor was sure they would choose the City. But he forgave Lechia soon afterwards as a father does a wayward son. Every year the City was helping Lechia financially and also was sustaining the Amber elephant stadium. ‘– Mr. Mayor – help! As mentioned before Lechia was always political, so there was some whispering in the VIP section during a heavy home loss to Piast Gliwice. Paweł Adamowicz just announced he would be running for another term. Civic Platform, his former party, threw him out and put Jarosław Wałęsa (Lech’s son) up as a candidate. But Adamowicz won again after an excellent campaign against all the odds. Maybe if he’d given it up he wouldn’t be on stage during this charity event when he was fatally stabbed? But that wouldn’t be him, he was a fighter. On Thursday night football fans bid farewell and paid their respect to the tune of his favorite song ‘The Sound of Silence’ at the Mayor’s favourite venue – the totally refurbished Ołowianka Island just in front of the historical crane – one of Gdańsk’s many historical sites. Now Lechia leads the table and have a great chance to play in Europe for the first time since the Juventus game. An event called: ‘We will become champions of Poland to honor the late Mayor’ was created on Facebook. It’s only sports, anything can happen. 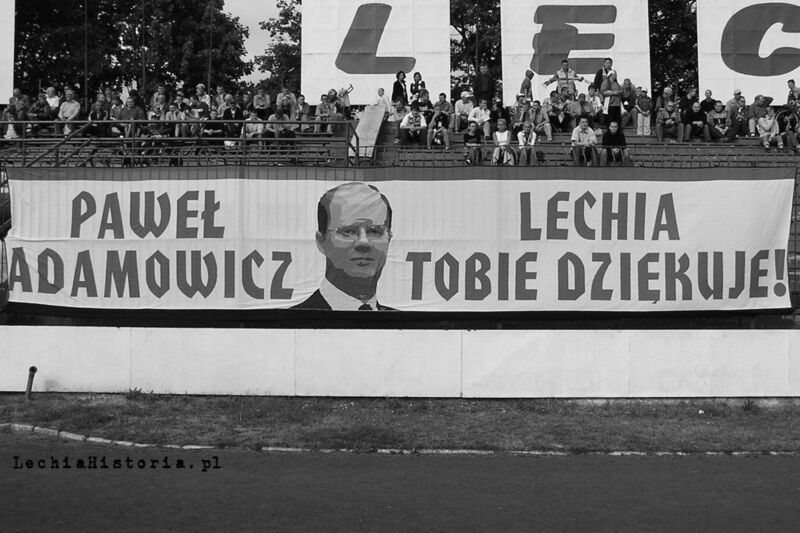 No, no, it’s us, fans of Lechia who thank you Mr. Mayor. We will remember you always. This entry was posted in Uncategorized and tagged Gdańsk, Lechia Gdańsk, Paweł Adamowicz. Bookmark the permalink.